I made this in bulk last Christmas and shared it with family and friends. And then I made myself another batch. And another. It would call to me from among the boring cereals and oatmeal in the pantry. . usually at night. . and I would find myself eating a bowl of it at 9pm! 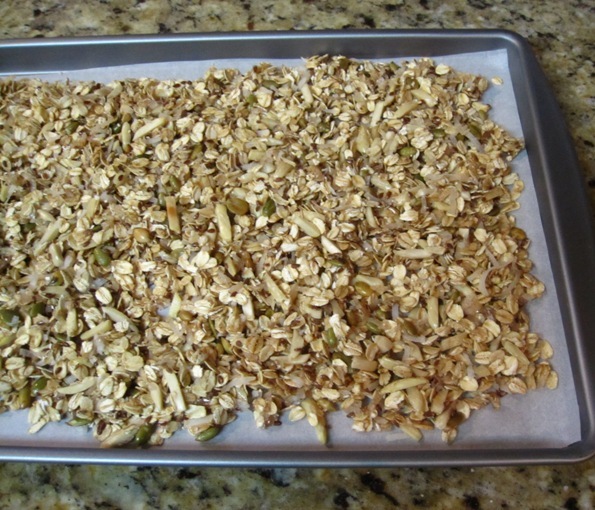 Then after a week or so I would have to make even more granola. Over and over and over. Finally I realized I had a granola problem. I couldn’t find any granola support groups so I stopped cold turkey and didn’t make it again for a long time. Too tempting. 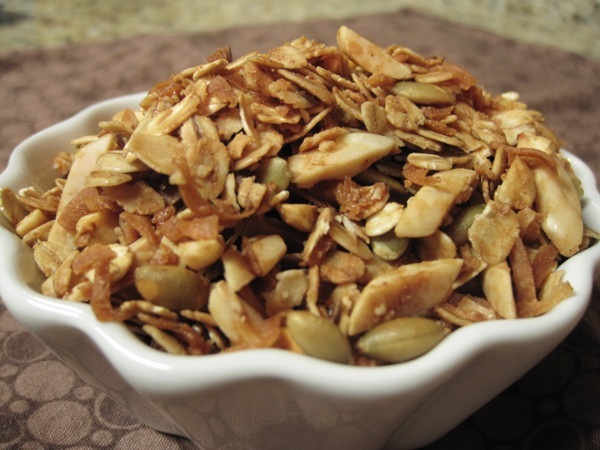 Breakfast blogging is a perfect time to resurrect the granola. Yay!! If I fall off the granola wagon, slap my hand. You can also add dried fruit if you like. 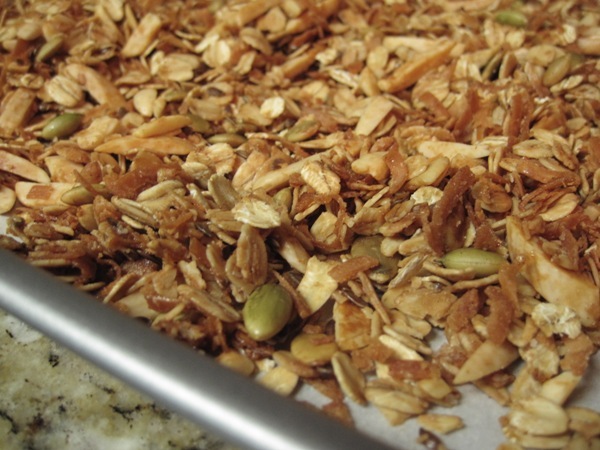 Just bake the granola as is and when it comes out of the oven and cools a bit, stir in a cup of chopped dried fruit. Dried cranberries or cherries are very good in this. You can also switch to a different nut of you like. I bet pecans would be work great. It gets all toasty and golden after baking and it is delicious. Good on yogurt, ice cream, with milk, on pudding, etc, etc. But more on that later. Preheat oven to 250 degrees. 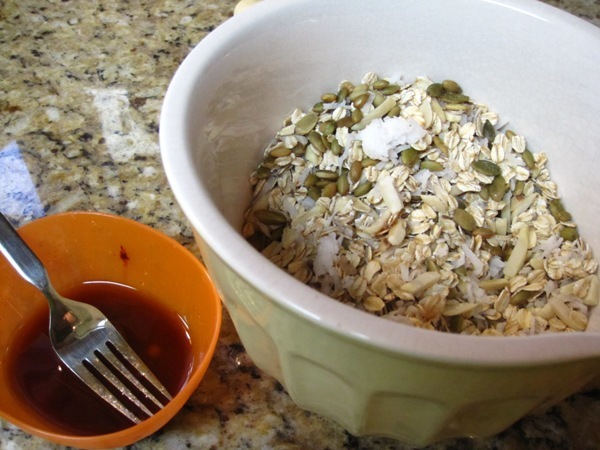 In a large bowl mix together oats, nuts, coconut, flax and pepitas. In a small bowl whisk together honey, oil, salt and cinnamon. Stir the honey mixture into the oat mixture until everything is completely coated. Pour the mixture onto a parchment lined baking sheet. Bake for 1 hour and 15 minutes. Stir every 15 minutes. Allow to cool and store in an airtight container.